WINTERSVILLE — Localizing national news is often easy for Alan Hall to do, not only as director of the Public Library of Steubenville and Jefferson County but also as a history buff. And his connection to Two Ridges Presbyterian Church in Wintersville helps, too, in this case making the recent death of former First Lady Barbara Bush something that has a Jefferson County I-didn’t-know-that angle. The wife of former President George H.W. Bush and the mother of former President George Bush had ancestors in the Ohio Valley, some of them buried in Two Ridges Presbyterian Church Cemetery. “Her four-great grandfather, Moses Coe (1750-1813), was born in Morristown, N.J., and moved to Washington County, Pa., in the 18th century, marrying Sarah Howell (1753-1813) in 1778,” Hall notes. “The Coes owned land in both Washington County, Pa., as well as Island Creek, Jefferson County, Ohio, where they were parents to five children whose families were part of Two Ridges Presbyterian Church for generations,” Hall said. “Barbara Bush’s other ancestors in our area were Joseph Gladden (1763-1833) and his wife, Hannah Munn (1773-1820), who were members of Two Ridges Presbyterian Church and are buried in the cemetery at the church. The Gladden family was church members throughout much of the 19th century,” Hall explained. “The children of both couples married, Daniel Coe (1801-1851) and Mary Gladden Coe (1804-1893) and moved to Union County, Ohio, near Marysville, Ohio, establishing a grist mill on Darby Creek in 1836. Today, the Darby Coe Road in that area is named for him,” he continued. “They had a daughter, Sarah Coe Robinson (1831-1901) who moved into Marysville, Ohio, married John William Robinson (1831-1920), and their son, Judge James Edgar Robinson (1868-1932), became a lawyer who served as the prosecuting attorney for Union County, Ohio, as well as being appointed to the Ohio Court of Appeals,” Hall added. “From 1919 until his death in 1932, he served on the Ohio Supreme Court. James married Lulu D. Flickinger Robinson (1875-1957), and their child was Barbara Bush’s mother, Pauline Robinson Pierce (1896-1949),” he continued. “Marvin Pierce (1893-1969) and Pauline Robinson Pierce lived in Rye, Westchester County, N.Y., and Mr. Pierce became the president of the McCall Corp., publisher of the popular women’s magazines McCalls and Redbook. They had four children, including Barbara Pierce Bush, who was born in 1925,” noted Hall, clerk of session for Two Ridges Presbyterian Church. It was when Two Ridges Presbyterian Church was preparing to celebrate its bicentennial in October 2002 that Hall first became aware of Barbara Bush’s ancestors and connection to the church, its committee even extending an invitation for her to be a part of it. Hall shared a copy of the Feb. 22, 2002, letter extending appreciation for the invitation but her inability to pay a local visit. Written by an aide to Mrs. Bush, the letter noted the former first lady was “flattered” to have been invited and appreciative of the genealogy report researched and sent. “With the growing interest in genealogy after ‘Roots’ emerged in conjunction with the U.S. Bicentennial in 1976, I wasn’t surprised that presidential family genealogy was being researched, but was surprised about Barbara Bush, as I didn’t know her Ohio background,” Hall said of his reaction to first learning of her local connection. “There is a large monument to the Coe family in the Two Ridges Cemetery, which would be a brother and son of the Moses Coe whom Barbara Bush was descended from, and beside it is the Civil War soldier that the Coe family cared for in 1863 who was injured in the Morgan’s Raid skirmish that took place at the ‘Two Ridges Church Meeting House,'” Hall explained. “The soldier died about a month after the skirmish after being cared for in the Coe home, and the Coe family allowed him to be buried in their family plot in the cemetery,” he continued, noting Ken Dornbush is a member of the church and a Coe family descendant. The church also has Gladden family members who would be connected to Bush’s ancestors. “The Gladden ancestors are buried there, but there is no apparent remaining stone. 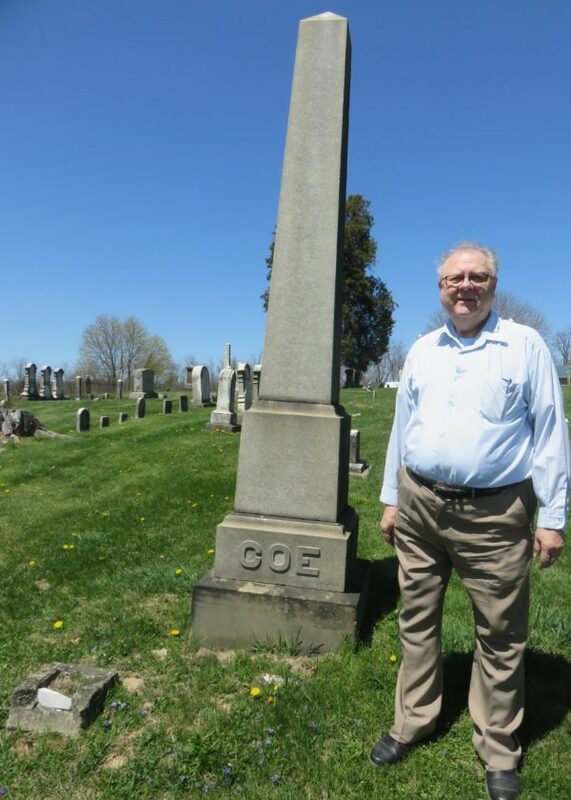 The Coe ancestors are buried in Marysville, Ohio, but other Coe family members — brothers and sisters — are buried in the cemetery,” he said. The church cemetery was established in 1802, one year before Ohio became a state, according to Hall. “The first church building was located in the cemetery from 1810-1853 when the church building was constructed up on top of the hill. The current building was constructed in 1887 on the site of the 1853 building. It is estimated that 400 people are buried in the Two Ridges Cemetery. The back part of the cemetery is the oldest, and in 1910, the front portion was added. There are still burials in the front portion in lots purchased in later years, but in general, it is now full,” he explained. As clerk of session, Hall said he answers genealogical inquiries that the church receives every year. “People think that old church records are filled with genealogical information, but it is really bits and pieces of information that may or may not be helpful in the search,” he said. “I assembled membership rolls from 1820-1946 and indexed that information to help and am trying to assemble session (church board) minutes which also start in 1820, but they are quite scattered in format. From 1802-1820, records don’t exist except for what survived from the Ohio Presbytery, as 1820 is labeled Vol. 1. Cemetery records don’t exist pre-1940 when the first ‘monument readings’ were done, and an exhaustive reading was done in 1997,” he continued. “In early days, a church cemetery had sections where families did burials and often a wooden cross was placed there that ‘went away’ with time. Some of the monuments are in good shape, and others crumble with time. Before modern lawn-mowing equipment came along, cemeteries were cleared with manual farm equipment, and church minutes often mentioned that someone ‘sighed’ the cemetery once a year. Families would sometimes care for ‘their plots’ which were surrounded by their own fence,” he said.